Robin says: The flavor of Manchurian cauliflower is so intoxicatingly delicious that I decided to spread it around. 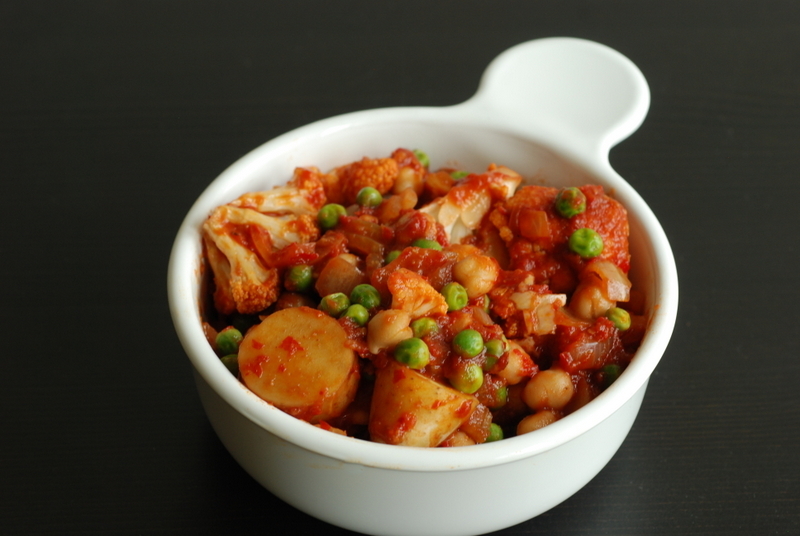 It turns out that potatoes and chickpeas are perfect vehicles for the wondrous sauce that’s made with ginger, garlic, tomato, and fragrant spices. Best of all, it’s a meal in a bowl! 1. Steam the cauliflower and potato over boiling water until just tender. Remove from the heat and transfer to a large bowl. Add the chickpeas and green peas and set aside. 2. Heat the oil in a large deep skillet over medium heat. Add the onion, cover, and cook until softened, stirring occasionally, about 5 minutes. Add the garlic, ginger, coriander, and cumin and cook for 1 to 2 minutes. Stir in the tomato paste, ketchup, tamari, hot sauce, and sesame oil. Slowly stir in the water and simmer until the sauce is thickened and well blended, about 2 minutes. Taste and adjust the seasonings, if needed. 3. Add the chickpeas and vegetables to the skillet, stirring gently to coat with the sauce. Cook for 2 to 3 minutes to heat through. To serve, divide the mixture among serving bowls and sprinkle with the scallions and cilantro. Yum!! This sounds great, Janet! And gobi manchurian is a well known Hakka dish! A lot of Hakka dishes are described as ‘manchurian’ for whatever reason. Ever since I tried gobi manchurian at a restaurant I have been trying to resist frying up a batch for myself =P so good. Love the chickpeas spin on it. I make a southwestern bean casserole or bean burritos. Put shredded vegan cheese and 2T of salsa in a pita and heat it in the microwave for two minutes. Delicious and quick. My favorite easiest and quickest vegan meal ? A big salad full of spinach, kale, cucumber, kalamata olives, tomatos, artichokes and sometime I add chickpea or if I have some marinated and grilled tofu or tempeh already in the refrigerator, I’ll add it. Simple, hey ? !…but so delicious. I use the brine of the olive for dressing or sometime even raw sauerkraut. Quickest vegan meal? Leftover fried rice or noodle with leftover veggies! My go-to fast food is whatever I have cooked & raw in my fridge. That usually means at least one kind of beans, sweet potatoes, steamed carrots, plus all sorts of salad fixings. Big bowl + big pile of food, topped with salsa & lemon juice, and I’m a happy camper. That Manchurian bowl looks so dig-in delicious…thanks for sharing the recipe! My favorite quick easy meal is a hummus wrap in a tortilla (or giant leaf of greenery) with whatever veggies are in the fridge or olives or salsa added in. Cheers! I do a one skillet meal with gnocchi, white beans and greens, adapted from an Eating Well recipe. It’s quick, easy, tasty and healthy. Thanks for the intro to Manchurian cuisine! I’m familiar with Gobi Manchurian but that’s the extent of my Manchurian knowledge…This dish looks right up my street, like most of Robin’s recipes do. I don’t know why I don’t have any of her cookbooks?! This last month while I’ve been away I’ve been exclusively very simple meals. A lot of bowls- quinoa, chickpeas, broccoli & tahini sauce is one I never tire of. P.S. How on earth do you manage to have leftover roasted cauliflower? As long as I keep fresh veggies in the fridge and cooked brown rice in my freezer, I’ve got a quick meal. Takes just a few minutes to steam broccoli, carrots, zucchini, mushrooms, greens, whatever, and put that over rice. Wow this looks great. I like a quick laksa with lots of vegetables and tofu. Simple but delicious. Moroccan Chickpea Soup from Amber at Fettle Vegan is my favourite quick and easy vegan meal. Uncomplicated, fast and oh so delicious. We always make sure we make extra to take to work the next day! I always keep peanut butter and fresh bread as a backup because sometimes I get way too busy to do much else. 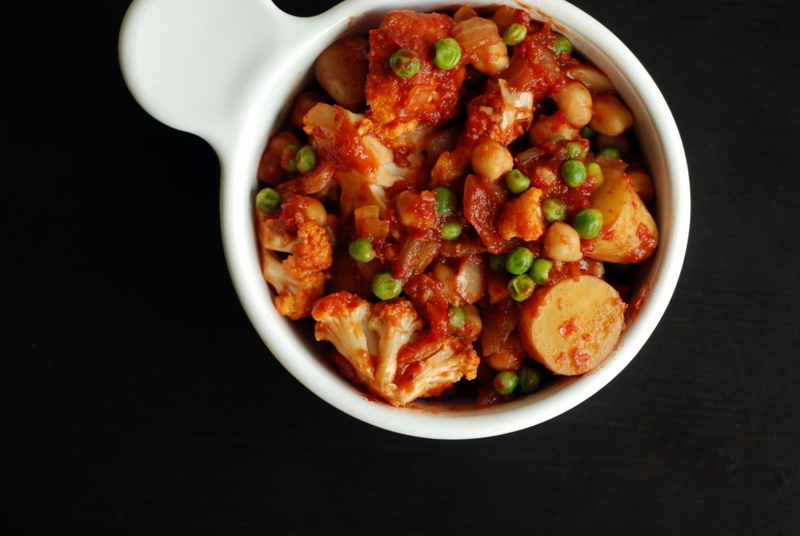 This manchurian chickpea bowl sounds really good! It’ll be a great way to give a fresh new twist to basic ingredients that are old favourites! One of our go-to quick and easy recipes is a simple red lentil dahl. I also often turn to socca when I don’t have much time and still want to put something delicious on the table. Pile a large plate with kale, collards or spring greens. Use up to a can of beans, and a cup of salsa on top. You can heat the kale, collards , beans and salsa if you want. It is really good, fast and easy. This looks like such a warm and comforting dish. I have Robin’s Vegan Planet- actually it was my first vegan cookbook- and love it so would love to get my hands on another! My quickest meal would have to be a tin of chickpeas and kale with nutritional yeast, lemon and olive oil- yum! Hi Pauline, Congratulations! You were picked as the winner of a new copy of More Quick Fix Vegan. Please check your email for more information. My Quick Easy Meal is Curried Lentil Soup w/Spinach and Veggies. Usually the easiest is just a salad but I would love to be able to make quick and easy meals since I just started a new job and my cooking time is going to be severely curtailed. Thanks so much for the chance to win and for the recipe! Most of the time a chickpea salad kind of dish is the fastest but I would like to be able to make meals that are hot and tasty. Thank you. My go-to quick vegan meal is a tofu and rice noodles soup. i marinate tofu quickly in tamari, ginger, garlic and a little maple syrup. In the meantime, I heat veggie stock, throw the tofu and marinade in it, add whatever veggies I have and wide rice noodles, then serve it with scallions. cilantro and sriracha. Tofu scramble is a favorite quick meal. I usually have veggies chopped up and ready to go in the fridge to make it extra-easy! A big salad with raw vegetables and leftover steamed vegetables, leftover cooked grains, some nuts/seeds, and I throw in some canned beans or tofu. It turns out different every time and is always delicious. My quick vegan fix is a miso soup full of fresh vegetables and herbs, tofu and rice vermicelli, yummy! My all-time favorite quickest, easiest, most flavorful vegan delight is Spicy Mustard Chickpeas on Spinach & Basmati Brown Rice from page 44 of Happy Herbivore abroad by Lindsay Shay Nixon … also LOVE most of Robin’s creations too … SO MANY GREAT VEGAN COOKBOOKS OUT THERE FOR ALL OF US (vegans & non-vegans) to Savor & Enjoy ! ! ! Quick, easy, vegan describes this mornings’ brekkie: 1/3 lb organic sprouted tofu and homemade kim chee fork-mashed with vegan mayo & sweet chili sauce, spread on sprouted cinnamon raisin toast. I usually have curried chickpeas and/or veggie/tofu, etc. in the ‘fridge. Throw a chapatti in the flat pan, while heating the filling, then prepare a hot and tasty burrito! Or steamed broccoli, dressed with flax oil and lemon, over a bowl of quinoa. Quick, nutritious and filling. My favorite quick meal is a taco salad: shredded lettuce with whatever veggies I can find, warmed organic refried vegan black beans, salsa, nutritional yeast and hot sauce. So easy and delicious! My fastest meal: a drained can of white beans microwaved with Earth Balance, nutritional yeast, and Cajun seasoning. I have been vegan for almost 2 years, but only have one little vegan cookbook! That surely needs to be changed. My quick and easy meal would be brown rice + steamed spinach with garlic and sea salt + an avocado! I turn to my “Indian pantry” for a quick meal….chana masala or dal with basmati rice…and I know the leftovers will be even better! Quickest recipe would be the chickpea scramble from Isa Does It. I make it frequently for breakfast and often mix up the type of beans and spices. For example, use white beans, fresh basil, and a squirt of lemon instead of chickpeas and dill. It’s so, so good. 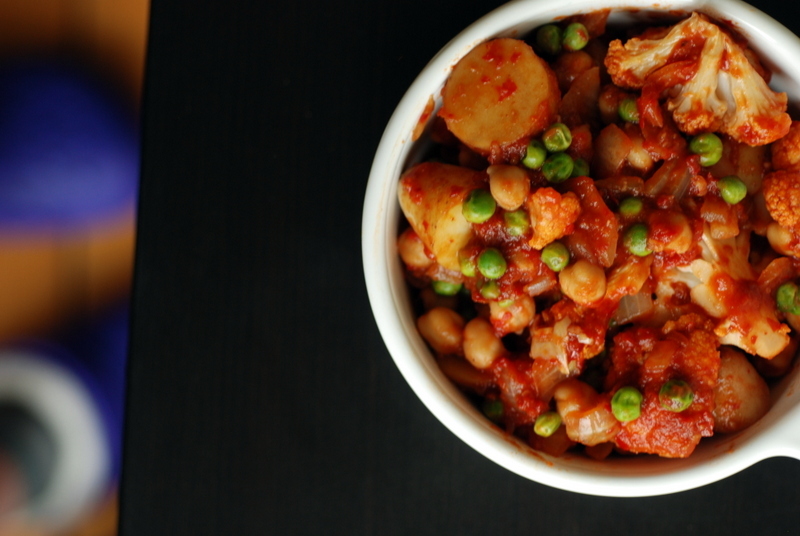 Love gobi manchurian—even better with potatoes, chickpeas, and peas. We are fortunate to have a great Indo-Chinese place close by. And yes, the purple slippers are fabulous! Thank you so much for including the link to my post! Oh my gosh!!!!!! So there is this Indian place that does manchurian cauliflower that I LOVE!!! It’s called Madras Pavilion right on Kirby…so good. It’s fried, so not the healthiest…but omg. This looks like a GREAT way to get my fix without the frying! Definitely want to try this. And my favorite quick vegan dish…probably a simple salad of lentils and roasted veggies with a lemony dressing. I ❤ lentils. Ugh I’ve never been! Must go! Before you go, can you please give a list of your fav restaurants in Houston? I feel like you know all the good vegan ones! And you’ve found so many that I’ve never been to! 3. Hugo’s – I like it because my omni friends have fantastic food and they have a wide variety of veg-friendly meals (way cheaper) and when you say you are vegan they even remove the milk from the hot chocolate, etc. My go-to quick vegan meal is usually a potato with salsa on it if I’m just cooking for myself, or spaghetti if it’s for the family. I roast golden beets, oyster mushrooms, spinach, garlic, leeks and tofu with various seasonings. I heat some precooked quinoa, black beans, and tofu cubes in the microwave and add chili powder, black pepper, and vegetable oil. Flavorful enough not to be boring. I like quick and easy meals. I like to roast many veggies. My quick and easy go-to vegan meal is coconut red lentil soup. I have my own secret recipe that is killer and ready in under 30 minutes! I would love more recipes though! I just love Robin’s cookbooks! My favorite quick meal is probably pasta with red sauce & salad. Yum this looks great! Can’t wait to try it! This looks fantastic! Definitely adding it to the list. As for quick and easy meals…I’m a big fan of tofu scramble (any time of day!). Quick comforting meal to me is a lovely plate of wholewheat fusilli with spicy tomato sauce 🙂 THANKS for opening the giveaway to everyone! Adore the seasoning used in this dish. Some of my favorites for sure. Once the beans are cooked, chana masala is always a quick and easy favorite. I just made this for dinner tonight. All four members of my family, including me, gave it the thumbs up. This was not typical and pretty exciting. I think that the sauce was rich but also Asian so there was sort of a comfort food cross over. The comfort food types: wife and son, had middle ground with more adventuresome types, daughter and me. It was very tasty and satisfying. I have already gotten requests for it again. Chinese Vegan examples sound so good. My quickest meal is Refried Bean Taquitos from Happy Herbivore Abroad. My current fav vegan quickie is a tortilla with smooshed sweet potato or squash topped with smashed chickpeas, a sprinkle of cayenne, drizzle of maple syrup & daiya cheese on top, ala Kathy Patalsky. Fold in half & fry in non-stickpan until daiya melts…….Yum! I love your purple slippers! Last month my boyfriend gave me a pair of very cute pig slippers; they make me smile every time I look at them! For quick-fix meals I love turning to ‘Quick Fix Vegan’ – the recipes in there are so versatile and appeal to both myself and my omnivore boyfriend. I also like throwing together a chickpea and zucchini korma over rice topped with plenty of coriander or I make up a huge pot of ‘spaghetti bolognese’ using TVP and the pasta sauce from ‘Isa Does It’ as a base. Top the pasta with plenty of homemade vegan parmesan and serve with a salad on the side and you have a very satisfying meal! Cauliflower anything gets my vote but all of the spices in this one really pique my interest even more. Partly reminiscent of my totally inauthentic take on Aloo Gobi. 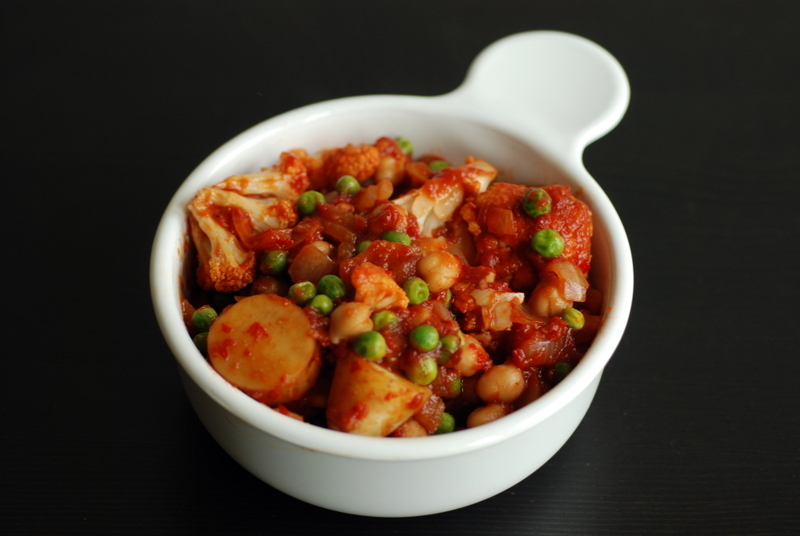 My favourite quick meals are all kinds of soups and stews packed with vegetables and legumes. Chopping, sautéing, boiling – done. delicious and wholesome… thanks for sending it to MLLA.. I made this and it was pretty good. It was even better the next day after the spices mixed into the sauce more. The kids were fine with it. My wife and I liked it a lot. The recipe states to taste and season as appropriate. I would recommend going a little heavier on the spices. They create a rich, interesting dish. It reminded me of a rich Turkish tomato sauce I had once that was on eggplant. I will make this one again. I happened to live in the area formerly known as Manchuria for two years, but never encountered a dish exactly like this. I am wondering if it migrated south and was preserved that way. In any case, it looks very delicious!